My first encounter with an English spoken country was Ireland, in 1992. And it was even my first vacations with friends, without my parents. It was one of the most amazing experiences I ever had: being a teenager, in a foreign country, in one of the most amazing and lively European capitals, very different from now days Dublin (I mean, Dublin is still an amazing city, but completely different!). And, of course, my first encounter with beer. But Irish, black, thick, tasty beer: Guinness. Marinate the chicken breast stripes in the Guinness for few hours. 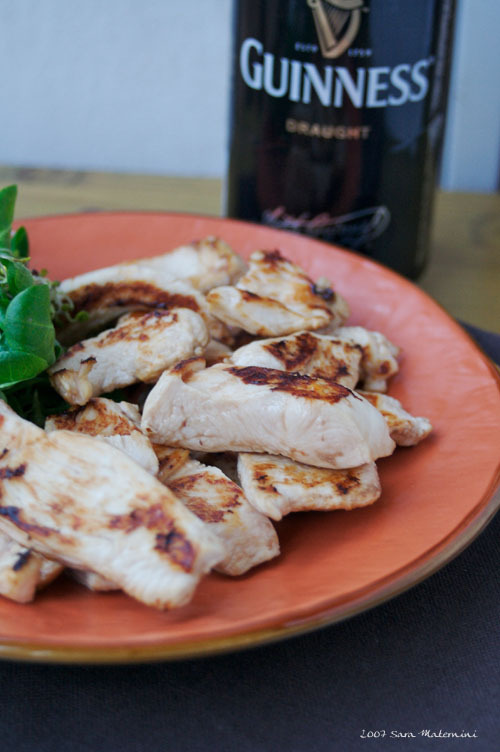 Grill the chicken pieces and serve it with a nice salad. I love Guinness–so rich and smooth. I haven’t been to Dublin yet, but hope to make it there soon. What a great idea! I wonder if the recipe is suitable for kids, though. I mean, the alcohol does cook out, doesn’t it? Well, it doesn’t taste any more as alcohol, and it should evaporate. But I can’t tell you for sure that there isn’t any more..